Succulent elegant décor can be incorporated into many different styles. We will show you step by step how to create a succulent collage in a frame. Succulents are very difficult to kill and require little maintenance to survive indoors. Succulents are very adaptable houseplants and will thrive in a range of indoor conditions. 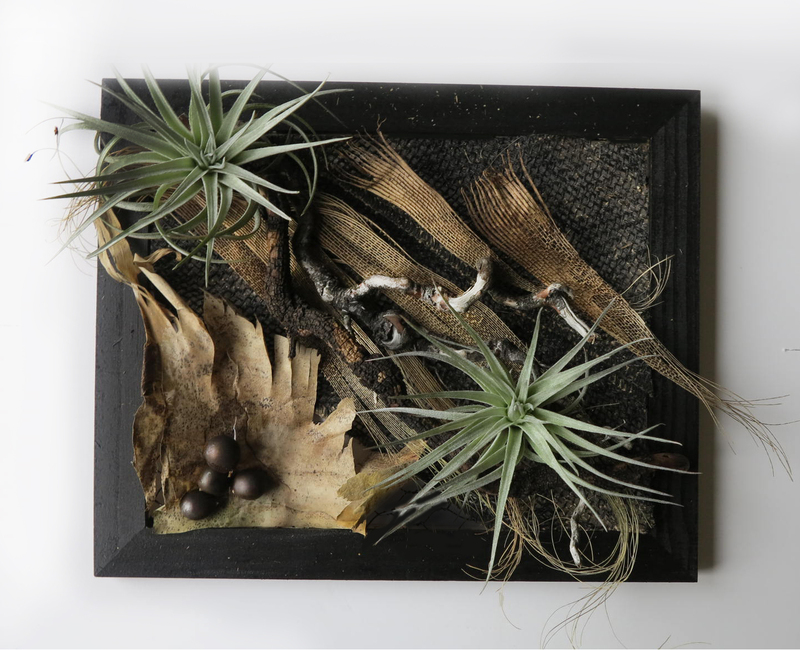 Besides succulents, in a collage you can use dry leaves, roots, bark, moss; any botanical and man-made materials. Botanicals: acacia seeds, dry roots, palm bark, and air plants (Tillandsias). Keep the air plants for a couple of hours floating in water. • Brush on a coat of outdoor paint to change the color of the frame and offer some protection against the elements. For an antique effect, let the paint dry for a few minutes and then wipe the frame with a clean cloth. Allow the frame to dry completely. Paint a piece of chicken wire and staple to the frame. Now create a background. First select a pattern of a background you are going to follow. It could be: parallel or diagonal lines, circles, waves, ovals or any other geometrical or free figures. To create dynamic design, we are going to fallow diagonal order of elements. Paint burlap ribbon with black paint, let it dry and cut two pieces covering one corner of the picture – glue it with a glue gun. Fallow the selected pattern, glue pieces of bark to the chicken wire. To add some a bit of texture, glue a group of acacia seeds. Using floral wire , attach roots to the chicken wire fallow the selected pattern. After the background is completed, create a focal point. A focal point is created with a group of air plants (select varieties of air plants that grow very slow staying small for long time). Pock floral wire through a bottom of a plant and attach plants to the roots. Use little pieces of dry plants or moss to camouflage wire. Keep the living succulent picture out of direct sunlight for a week or two to allow plants adjusting to the environment. Gradually increase light levels to full morning sun exposure. Water ones a week by letting air plants soak in a bath of water for 20-30 minutes. You can use a bowl or sink. Submerge only plants and little part of the roots but protect from getting water on dry flowers, leaves or bark. After the bath, gently shake the picture to remove any excess water from the base and the leaves. Set the living succulent picture on a table or shelf where it can be propped up against a wall or hang the frame on a wall. Set a living succulent picture near a south-facing window. Protect from midday sun – it will burn succulents and discolor dry leaves, flowers and bark.